Here are videos about Empty Mansions and Huguette Clark from "The Daily Show with Jon Stewart," "The Today Show," TV Santa Barbara, The Wall Street Journal, C-SPAN (twice), CBS 2 New York, Christie's auction house, WTCI in Chattanooga, and our own video tour of Huguette Clark’s doll collection. 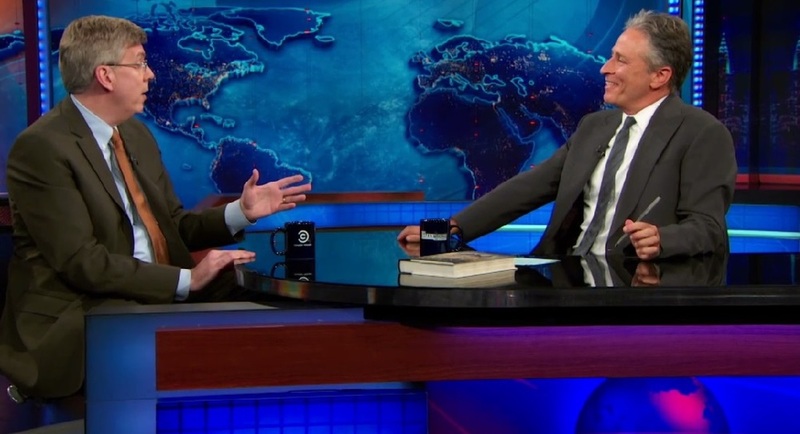 Bill Dedman appeared on "The Daily Show with Jon Stewart" on Sept. 10, 2013. “It’s one of those incredible stories you didn’t know existed,” Stewart said. “It filled a void.” Watch the interview below or follow this link to "The Daily Show." NBC’s "The Today Show" covered Empty Mansions, finding it “a fascinating story.” Co-authors Paul Clark Newell, Jr., and Bill Dedman were interviewed by correspondent Erica Hill. Watch the video below or follow this link to "The Today Show." The show includes a snippet of Paul's converations with his cousin Huguette Clark. 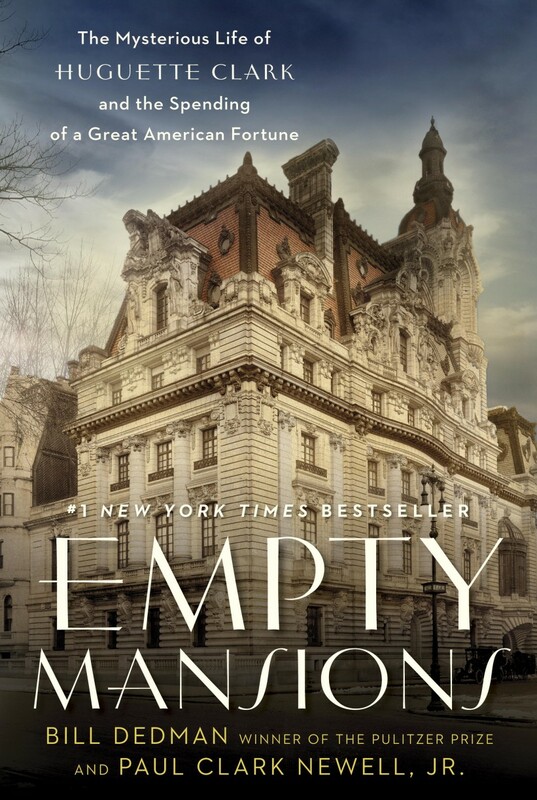 You can hear more of Huguette's voice in the audiobook version of Empty Mansions. Here’s a recent special from TV Santa Barbara on Huguette Clark and the future of her summer home, Bellosguardo. Included are photos from Empty Mansions: The Mysterious Life of Huguette Clark and the Spending of a Great American Fortune. Interviews were conducted at our events in October, where 600 people came out to the Santa Barbara Historical Museum. Interviewed for the video were authors Bill Dedman and Paul Newell, Santa Barbara Mayor Helene Schneider, former Mayor Sheila Lodge, and Huguette’s California attorney, Jim Hurley. The video includes a snippet of Huguette’s voice. (More recordings are in the audio version of Empty Mansions.) Thanks to SBTV’s Jared Malone, J.P. Montalvo, Jeff Green, Henry Baker, John Macker, Deborah Manning, and Matt Schuster, to the staff at the historical museum for their cooperation, and to John Wiley for his aerial photography. Note one small error in the script: Bellosguardo is not bequeathed to the City of Santa Barbara, but to the Bellosguardo Foundation. Watch the video below or follow this link to the video on YouTube. We’ve created a video of Huguette Clark’s doll collection, using Huguette’s snapshots. Note that the music is being played on one of Huguette’s Stradivarius violins. Update: Although Huguette's will left the doll collection to her nurse, in fact the doll collection will go to the Bellosguardo Foundation, as agreed in the settlement of the dispute over Huguette’s estate. See also the spring 2014 issue of Fashion Doll Quarterly for a feature on Huguette’s dolls. Watch the video below or follow this link to the video on YouTube. The Wall Street Journal interviewed Bill Dedman about the estate contest and included a bit of Huguette Clark’s voice, from her conversations with her cousin, author Paul Clark Newell, Jr.. Watch the video below or follow this link to the video at The Wall Street Journal. You can hear more of Huguette's voice in the audiobook version of Empty Mansions. From C-SPAN's Book TV: Co-authors Bill Dedman and Paul Newell talked about their book, Empty Mansions: The Mysterious Life of Huguette Clark and the Spending of a Great American Fortune. They spoke at the 2014 Tucson Festival of Books, which took place on the campus of the University of Arizona on March 15-16. The moderator is Bill Buckmaster. Watch the video below or follow this link to C-SPAN. From C-SPAN's Book TV: Bill Dedman spoke about Empty Mansions at the 2014 Gaithersburg, Maryland, Book Festival. Watch the video below or follow this link to C-SPAN. CBS 2 New York covered the preview of the Christie’s exhibit in New York of Huguette Clark’s art collection. Watch the video below or follow this link. The first video is available from inside Huguette Clark's home in Santa Barbara, known as Bellosguardo. To promote the auction of Clark items, Christie's has staged a few of the rooms, giving a video tour. No, the California house and its property are not for sale. They will go to the new Bellosguardo Foundation for the arts, which should get formed later this year. But the estate administrator is showing off the California house to raise interest in the sale in New York in May and June 2014, because that sale will benefit the new Bellosguardo Foundation. This video is generally accurate, though the narrator's idea that everything in the house is still where it was when Huguette and her mother last visited, about 1953, is fanciful. The staff has staged a couple of rooms for this video, though they don't match the photos we have of Bellosguardo from the old days. Also, the Corcoran Gallery existed long before W.A. Clark left his art to the gallery. But these are minor errors. Let's enjoy a first peek inside the Clark summer house. Watch the Christie's video below or follow this link to the video at Christie's. Then take a full tour of Bellosguardo on our photo pages. Bill Dedman was interviewed on "The A List with Alison Lebovitz" on Chattanooga's PBS station, WTCI. This was a chance for Bill to visit his high school, The Baylor School, and to discuss his teachers, his career in journalism, and Empty Mansions. Watch the video below or follow this link to WTCI. Bill Dedman was a guest of Rafael Pi Roman n MetroFocus from Channel Thirteen in New York City. See the video below or follow this link to Thirteen. Paul Newell and Bill Dedman were interviewed by Erik Pappa for Clark County television during their stop in Las Vegas for events at the Nevada State Museum. The discussion focused on W.A. Clark, Huguette's father, the founder of Las Vegas. Follow this link to YouTube.